Copy of directions for the treatment of the Earl of Cassillis, as drawn up by Cullen when he was in attendance upon his Lordship at Culzean [Cullean] Castle. This is a copy sent to Cullen once he was back in Edinburgh, as he requests in his letter to Dr Gillespie of 6 October 1775 (ID:342). Although no cover letter can be identified, we can safely assume that this document was sent, if not actually copied, by local physician Dr Thomas Gillespie in response to that request. 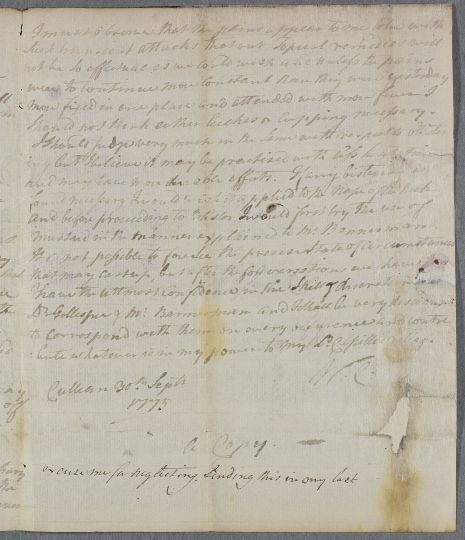 The document is entered on the database for 30 September, which is presumably when is was composed by Cullen, but this actual copy must have been sent to Cullen sometime after 6 October. 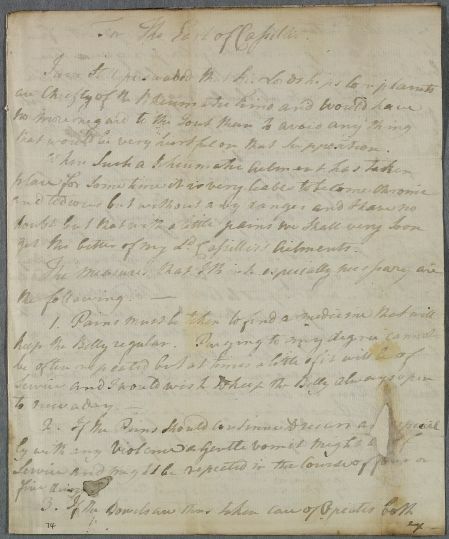 Summary Copy of directions for the treatment of the Earl of Cassillis, as drawn up by Cullen when he was in attendance upon his Lordship at Culzean [Cullean] Castle. This is a copy sent to Cullen once he was back in Edinburgh, as he requests in his letter to Dr Gillespie of 6 October 1775 (ID:342). Although no cover letter can be identified, we can safely assume that this document was sent, if not actually copied, by local physician Dr Thomas Gillespie in response to that request. 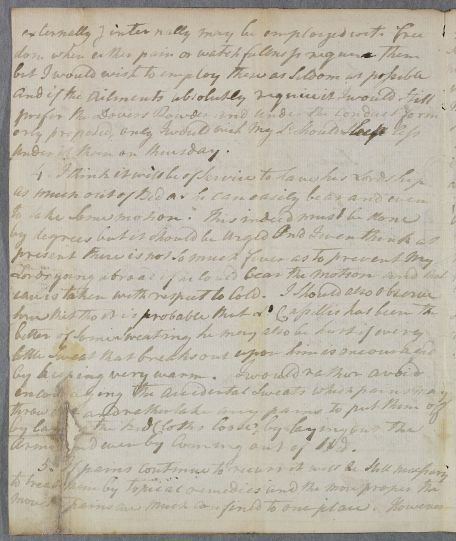 The document is entered on the database for 30 September, which is presumably when is was composed by Cullen, but this actual copy must have been sent to Cullen sometime after 6 October. Case of Earl Cassillis, who is fevered, weak and in a state of terminal decline; eventually includes a post-mortem report. For The Earl of Cassilis. that would be very hurtful on that supposition. get the better of my Lord Cassilis's Ailments. under it than on thursday. Arms [a]nd even by Coming out of Bed. should not think either leeches or cupping necessary. bute whatever is in my power to my Lord Cassilis relief. 1: For the status of this document see footnote below. 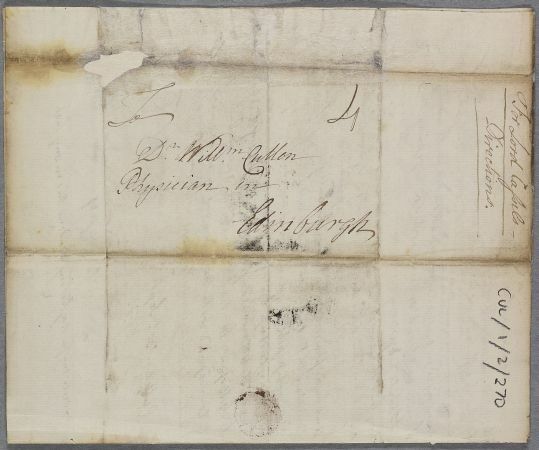 2: See Letter ID:342 for Cullen requesting that he is sent a copy of the directions he had drawn up while on his recent visit to Culzean Castle to attend Lord Cassillis in person. This implies that this copy was sent by Dr Thomas Gillespie in answer to that request and that this apologetic note was added by Gillespie himself. See details in the main note for this document. get the better of my Ld. Cassilis's Ailments. bute whatever is in my power to my Ld. Cassilis relief.